Greetings! This web page is dedicated to my father, Philip Howard FRAKES (1929-2005), of whom I am incredibly proud. To be able to say that you are my father gives me great pride. You have carried the Frakes name with honor. Your father, you, Uncle Bill and Aunt Judy have given the Frakes name back the honor it once held. Thank you so much for being the man you are and for providing me with a wonderful home and family and a most honorable name, FRAKES. I have great admiration, respect and love for you. This is a story about one FRAKES Family, ours. I have always had a fascination about family history. Even as a child and a teen I loved to listen to my grandmothers talk about their families. Family members who had lived and died before I had come into this world. I would sit and listen to them for hours about the family, when most kids my age couldn't care less about such things. And, my grandmothers, Beatrice Margaret Julietta (MERTEN) FRAKES and Grace (BASSETT) CONANT, were always happy to oblige. Our particular FRAKES Family's history, in written modern recorded history, begins in the 1500's in the beautiful countryside of Somerset, England. 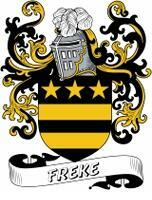 Our family name was originally spelled FREKE and pronounced as we would pronounce FRAKE, or the word rake with an "F". It has been stated that the family originated in Denmark before arriving in England. Wheather this is true or not, I do not know, but they had obviously been in England for generations to have risen to the point of landed gentry. 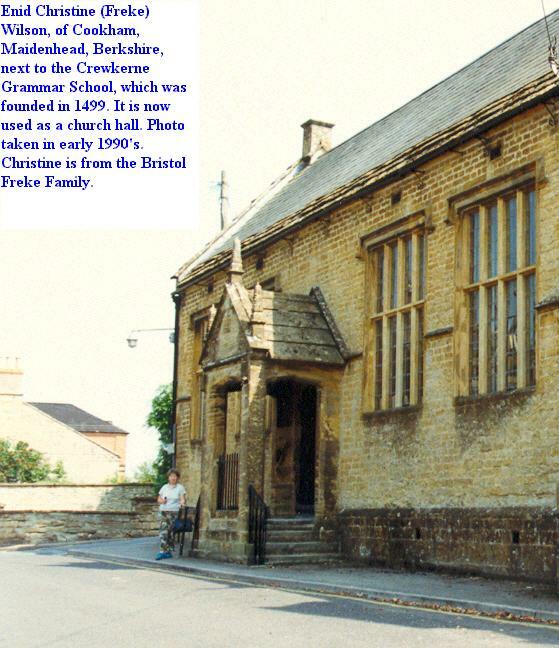 Our grandfather, Francis "Frank" FREKE was a man of note, living in Thorncombe, Somersetshire and he also had property in Crewkern, Somersetshire. In 1558 he was doing business with Queen Mary, better know as Bloody Mary, for whom the modern day drink is named. Mary was the eldest daughter of King Henry VIII. She was also a devoted Roman Catholic. When her father died, the throne went to her teenage younger brother, who was Protestant, as his father. He died young and she became queen. She went through the kingdom having Protestant ministers murdered and many of their followers imprisoned. The exact religious affiliation of Francis is not truthfully known, which is probably why he remained alive, or the fact that Queen Mary needed his help in certain matters. His brother, Edmund FREKE, became archdeacon of Canterbury, Canon of Westminster and nominated by Queen Elizabeth I as bishopric of Worcester, which would suggest that the FREKE family was Protestant. Francis' son, and also our ancestor, Robert FREKE, was the Teller and Auditor to the Exchequer for King Henry VIII, Edward VI, Mary I and Elizabeth I. Robert held the manor of Shroton in Dorset (originally know as Iwern Courteney) and had a vast estate. 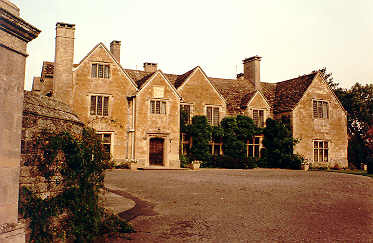 He purchased the manor and estate from the Earl of Pembroke in 1560. Robert was a very wealthy man. He was also very prolific. He had ten children. One of his sons, for whom we are not descended, moved to Ireland near the city of Cork. There he, William FREKE, had FREKE Castle. From him descended Sir Raufe FREKE, Baronet and from him the EVANS-FREKE family, namely Sir John EVANS-FREKE, Baronet, 6th Baron Carbery. Sir Thomas FREKE, Knight, son of Robert, son of Francis, for whom we descend, carried on the family name with great respect and passed it onto his children with great care and pride. In 1584, Thomas FREKE was MP, a Member of Parliment, from Dorchester. On 15 Apr 1603, Thomas FREKE was knighted at the coronation of King James I of England, by King James. In 1604, Thomas FREKE, Knt. was a Member of Parliment from Dorset. In 1626, Thomas FREKE, Knt. was a Member of Parliment for Dorset. Thomas was Deputy Lieutenant of Dorset for about 30 years. Thomas and his son owned the largest of the Dorset privateering ships. Thomas loaned money to both Sir Walter RALEIGH and Lord Burleigh. Sir Thomas FREKE is especially important to we American FRAKES because he was named one of the Council for Virginia in 1607. He later was a member of the Virginia Company. More on this later. He had vast holdings, which included the manor of Shroton and of Hinton St. Mary. He was very generous to the churches, ten of which he was responsible for. He built churches and added to several. He was greatly loved by his children. 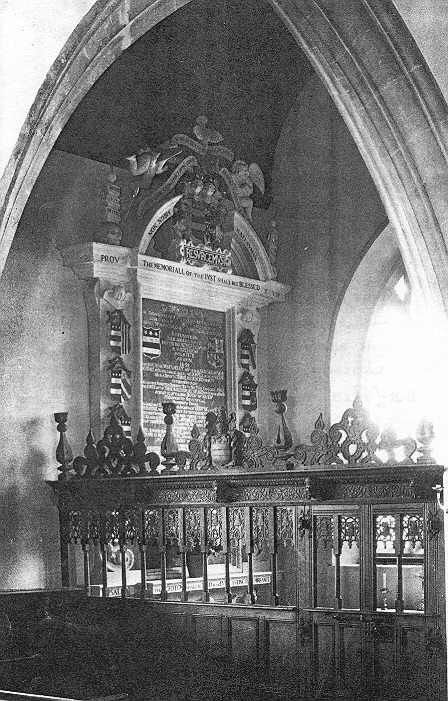 His two surviving sons, Raufe and William (both of whom married CULPEPER sisters, the CULPEPER family for whom the county in Virginia is named), built a very beautiful memorial to him and their mother in the Church of Shroton. I include the memorial here, as it not only is beautiful but it also shows their love for their parents. 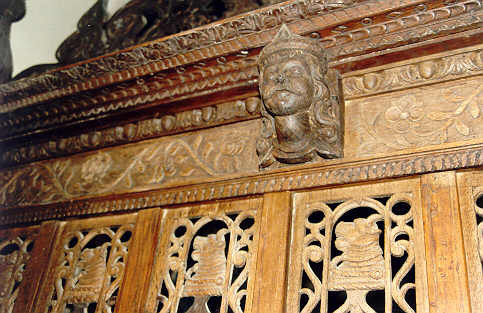 These are the wood carvings in the church of the FREKE Family Memorial. The FREKE Coat of Arms is also carved in the memorial. Lady Elizabeth FREKE, as was her title, founded, five years before her death, a free school in the village of Shroton, with endowment to pay for a schoolmaster. A new school was later built on the same location in 1850. Today it is named Elizabeth FREKE Hall. 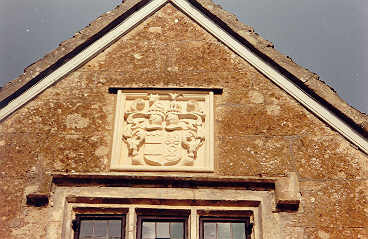 The FREKE Family Coat-of-Arms is engraved above the front door of the Manor of Hinton St. Mary. Their memorial can be seen in the parish chuch of Hinton St. Mary. The photo upper left is the front view of the FREKE Family Manor at Hinton St. Mary, Dorset, England. This is the home that our immigrant ancestor, John FREKE/FRAKES was born and raised in. 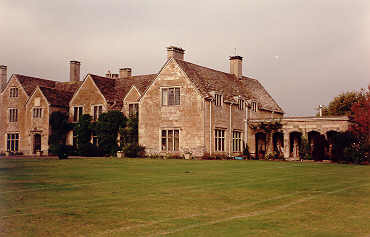 The photo below left is another front view of the manor. 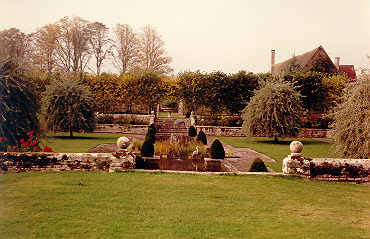 The upper right photo shows the sunken gardens of the estate. The manor can be seen in the background. 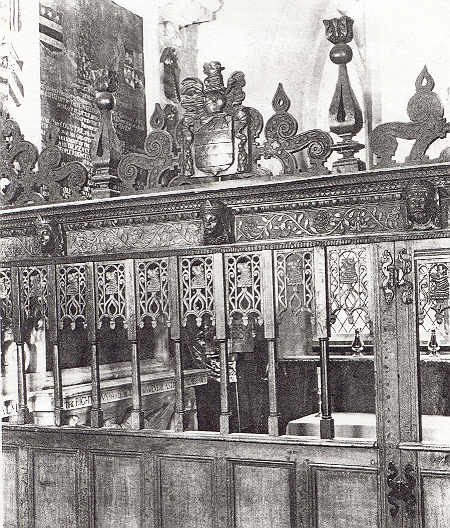 The lower right photo shows the FREKE Coat of Arms over the door. Only the left side of the Coat of Arms is FREKE. Before I move onto American and our immigrant to America, I must mention the next Lord of the Hinton St. Mary Manor, William FREKE, cousin of Thomas FREKE. He completed the building of the Village, which Mary had begun. He also added the E Wing onto the manor home. He became a gentleman commoner of Wadham College, Oxford in 1677 and later went to the Temple and was called to the bar. He made a name for himself because of his relgious beliefs. He refused to go along with the established church, the Church of England. He wrote several books. He was antitrinitarian and wrote on such. His theological writings were burned by the public hangman in the reign of King Charles II, by the order of the House of Commons and House of Lords. He was also fined 500 pounds. He spoke and read Hebrew. He never officially left the Church of England, even though the antitrinitarian beliefs were common among Baptists, Quakers and Sabbatarians of the time. He was thought quite strange by his father for not accepting the common beliefs of the Church of England, therefore he did not become heir of Hinton St. Mary. He did, however, remain living in the manor for his entire life. He was Justice of the Peace. He wrote twelve books in his lifetime. He should have gone to America where he could have written his beliefs without fines by the government. Tradition in England has it that the United Staes Seal and the Flag of the United States was adopted from the Freke/Frakes Coat of Arms and Banner. As before mentioned, Sir Thomas Freke, Knight, was a member of the Virginia Company. The banner by which the ships sailed was the red and white stripe of the FREKE/FRAKES Banner. Our founding fathers knew this banner well. And to add a bit more to the claim, the property that John WASHINGTON lived on and raised his son, our first president, George WASHINGTON, was purchased from William FREKE, a cousin of our immigrant John FREKE. 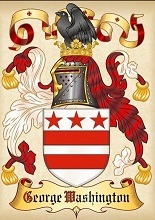 So President Washington would have been familiar with not only the FREKE/FRAKES Banner, but also the FREKE/FRAKES Coat of Arms, which had the stars and stripes. This William FREKE, remained in Virginia and married and had children. He had no sons, only daughters, therefore no one today is named FRAKES from this line. His daughter, Anne FREKE, married John HEABARD and they had a son William HEABARD. William FREKE/FREAKE was a wealthy man and large property owner. He was the neighbor of John WASHINGTON and Andrew MONROE, both of whom had sons who became presidents of the United Sates. It makes one wonder if there would have been a FRAKES president if William FREKE/FREAKE had had a son. Above left is the FREKE Coat of Arms. Above right is the Clarke Coat of Arms. The Coat of Arms below is that of our immigrant, John FREKE/FRAKES and his wife, Elizabeth (CLARKE) FREKE/FRAKES. The left side of the Coat of Arms is that of the Freke Family and the right side is that of the CLARKE Family, the common practice of two aristocracy families joining. This Coat of Arms is on the grave stones of John and Elizabeth in Boston, Massachusetts. It was a common practice for the younger sons of British Aristocracy to immigrate to America, Australia, or one of the British Colonies. The bulk of all British estates usually went to the eldest son, not that the younger didn't receive an inheritance, but not as grand. Therefore, many came to America to turn what they received from their father into great wealth. For some this worked, for others it did not. For our John, he did well. John FREKE/FRAKES, above left, was the immigrant ancestor to Boston, Massachusetts, New England. His wife, Elizabeth (CLARKE) FREKE/FRAKES and their youngest child, Mary, is above right. These paintings are hanging in a museum in Worcester, Massachusetts. 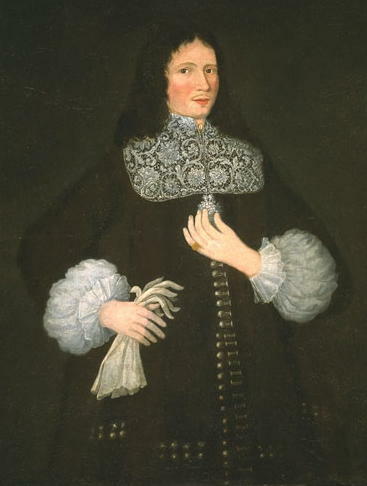 John FREKE/FREAKE immigrated to New England between 1658 and 1660. He had been born in 1631 at Hinton St. Mary, Dorset. He settled in Boston, Massachusetts. John was a merchant and lawyer in Boston. He married Elizabeth CLARKE, who was the daughter of a wealthy merchant and mill owner, Major Thomas CLARKE. 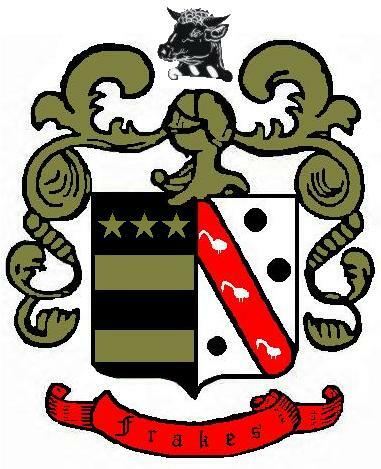 The family for whom half of our Coat of Arms comes from. 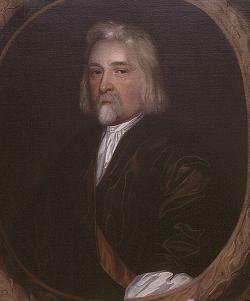 John was a loyalist to the throne of England and was the petitioner to uphold the King's unpopular Commissioners in Boston. He also served as Constable and was a Juryman. In business with Samuel SHRIMPTON, John co-owned a shallop called "The Philip." The Philip was captured by pirates in 1674. John petioned the court to go after the pirates, which they did, capturing them, but while they were in prison waiting for trial, tragedy struck. On the 4th of May in the year 1675, John and his good friend and fellow merchant, Captain Samuel SCARLETT, went aboard a ship from Virginia. While they were aboard an explosion occured in the cabin killing John instantly, Captain Scarlett died the next day. John was one of the most influential merchants of the day, unfortunately his life was cut short. He is buried in the Granary Burying Ground in Boston, Massachusetts with his Coat of Arms proudly displayed on his grave stone. 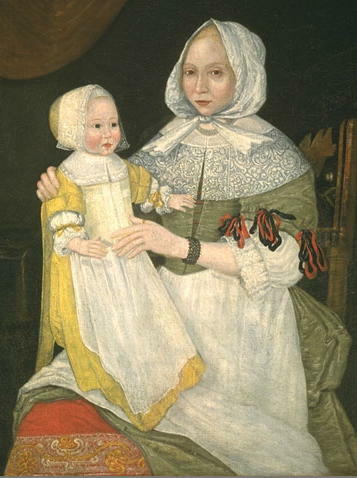 John and Elizabeth had eight children. The youngest, a daughter, being born two days after John's death. She was named for the first born, Mary, who had died young. Elizabeth married second to Elisha HUTCHINSON. Our FRAKES Family did not remain long in Boston. Two likely reasons being that their father died and their mother remarried, and because of an inheritance. John FREKE/FRAKES, Jr. received an inheritance of property in New York from his father's best friend, Captain SCARLETT. He therefore began the migration path westward for the FRAKES Family. John had been born in 1668 in Boston, Massachusetts. The name of his wife is not known, only that she was Dutch. 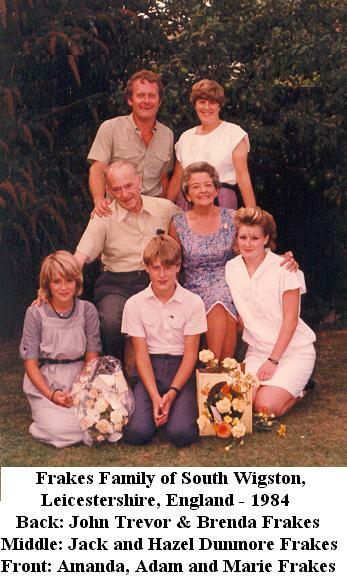 (I might note here that much of the connecting genealogy of the FREKE to FRAKES Family was received from our British cousins, among whom were Hazel (DUNMORE) FRAKES; Christine (FREKE) WILSON; and the granddaughter of Amos FRAKES of Castle Donnington. Unfortunately all of them are now deceased.) John had brothers Thomas and Clark. John, Jr. named one of his sons Philip, after the shallot of his father's that had been pirated when John, Jr. was five years old. It must have made an impression on him. Philip was born in New York in 1690. The exact connection of the rest of the FRAKES men is not known. It is know that they are family, but to which FRAKES they descend from is not known.. There was a Henry FRAKE/FRAKES and a William FRAKE/FRAKES, whether they were John's sons or John's brother's sons, it is not known. Only that they were of the same family according to the imformation provided from our FREKE family in Britian. John was named in a military report: "He had acted as a guide for two men accused by the local squatter-settlers with spying out the land for speculative purposes." He was therefore accused of aiding the British during the war. At some point the family used the name of FRIGGS to protect themselves. When John first came back to America from Canada, he settled in Kentucky under the name of John FRIGGS, Sr., this was in 1781, but by 1790 he was listed as John FRAKES, Sr. He owned land in what was Hardin County and Nelson County, Kentucky. 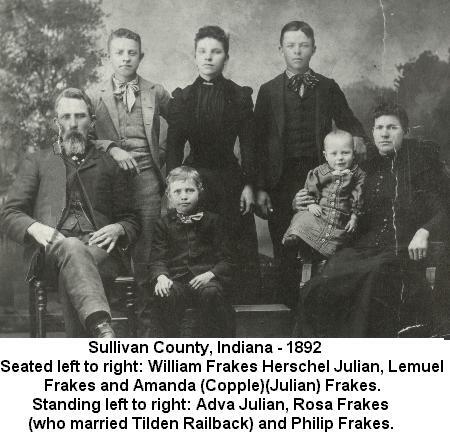 John FRAKE/FRAKES, had eight known children. They were: John FRAKES, Jr., Philip FRAKES, Conrad FRAKES, Peter FRAKES, Daniel FRAKES, William Henry FRAKES, Elizabeth (FRAKES) TURNER and Caty (FRAKES) MARKSBERRY. It is interesting that the name of Philip FRAKES has continued down throughout the generations of the FRAKES Family. All coming from the name of a ship named, "The Philip." Our Philip FRAKES married a Dutch woman named Phoebe CASE in Nelson County, Kentucky in 1788. She was the daughter of Nathaniel and C. R. (PEITY) CASE. The FRAKES men married into the Dutch for about three generations. This being handed down through the family lines that the FRAKES were Dutch. Of course pretending to be Dutch, it took away the accusations of being British Loyalists as well. Philip was in the Kentucky Militia in 1787 along with his brother Peter FRAKES. They were under the leadership of Major George Rogers CLARK who led a militia group in Kentucky during the Revolution and after the war he participated in a military expedition against the Wabash Indians,. The Philip FRAKES Family, along with the CASE Family, moved to Butler County, Ohio in 1807. This would have been shortly after the death of his father. Philip lived there only three years then moved to Dearborn County, Indiana in 1809, which was just across the state line from where they had lived in Ohio. This same land later became Franklin county, Indiana. The CASE Family also moved there. The FRAKES Family had the migration bug. They could not seem to settle down for very long at a time. Philip FRAKES sold his 647 acres of land in Franklin County and moved to Sullivan County, Indian in 1817, where he bought 245 acres of land. This land was in the northern part of the county and is now Vigo County. He eventually deeded all of his land over to his sons. In 1830 he moved to Middletown (now Prairie Creek) and built and operated a horse-powered grist mill. Philip and Phoebe FRAKES had ten children. Our next generation brings us to Aaron FRAKES. Aaron was born in Nelson County, Kentucky. He married Mary GREENE in 1810 in Franklin County, Indian. He first owned land in Franklin County, but made the migration with his father to Sullivan County. Aaron succeeded Rev. Isaac McCOY as minister of the First Baptist Church of Prairie Creek in Vigo County in March of 1817. The church had been founded in 1816 by Rev. McCOY and Daniel BOONE. The building was originally a log building thirty feet square. Aaron also ministered at the Honey Creek Baptist Church and the Maria Creek Baptist Church in Knox County. His ministry took him through Vigo, Sullivan and Knox counties. Unfortunately, Aaron FRAKES died young in 1821, leaving his wife, young children and his ministry. Rev. Aaron and Mary (GREENE) FRAKES eldest son was Johnathan H. FRAKES, born in 1811 in Franklin County, Indianna. He was the first of our family to marry into the McGLONE family. He married Sarah Isabelle McGLONE, daughter of William and Mary "Polly" (STAGGS) McGLONE. Jonathan was a successful farmer and mill owner. There are two large grave monuments for Jonathan and Sarah at the prairie Creek Baptist Church Cemetery. In the 1970's when I took some good photos of the grave stones, they were in excellent condition. Unfortunately by 2003, the acid rain is causing them to be less and less legible. One of Jonathan H. and Sarah Isabelle (McGLONE) FRAKES sons was William FRAKES, who was born the 4th November 1835 in Prairie Creek Township. He, as his father had, married a McGLONE girl. His wife was Martha Ann McGLONE, daughter of John and Hannah (AKERS) McGLONE, cousins to William's mother. William lived in Vigo County until sometime durng the 1890's. He then moved to Sullivan County, Indianna, where he had a farm. This is where he lived with his second wife, Amanda (COPPLE)(JULIAN) FRAKES, whom he married in 1884, after the death of Martha. William FRAKES had 8 children. 7 by his Martha and 1 by Amanda. They were: Francis Marion FRAKES born 1859 (See line following); Ruth Ellen FRAKES born 1862 (md Benjamin BAILEY); Joseph John Franklin FRAKES born 1865 (md Corda HANGER,); Mary Elizabeth FRAKES born 1869 (md George HALL); Thomas FRAKES born 1872; Philip FRAKES born 1874 (md Mary Ellen GASKINS); Rosa FRAKES born 1878 (md Tilden RAILSBACK); and Lemuel FRAKES (never married and lived in Orlando, Florida). His eldest son, Francis FRAKES brought back the earliest known ancestor's name of Francis. Francis married Hannah Margaret C. "Maggie" ARTHUR in 1886. She was the daugher of Joseph and Margaret (MINKS) ARTHUR of Greene County, Indiana. The first English wife since the immigrant ancestor married Elizabeth CLARKE. Francis Marion FRAKES and his two sons were caught in an early spring rain storm while they were in the buggy. The baby was wrapped well and didn't get wet, but Francis and eldest son, Van Cleave FRAKES, were soaked, causing them both to end up with pneumonia and dying. The farm was not a place for a young widow and her baby. She had a very difficult time. The many other FRAKES evidently didn't feel the need to aid her or her baby boy. She had to put her son in an orphanage, Rose Children's Home in Terre Haute, Vigo County, Indiana. She met and married James H. MEDAUGH, a somewhat wealthy man. She removed her son form the orphanage. 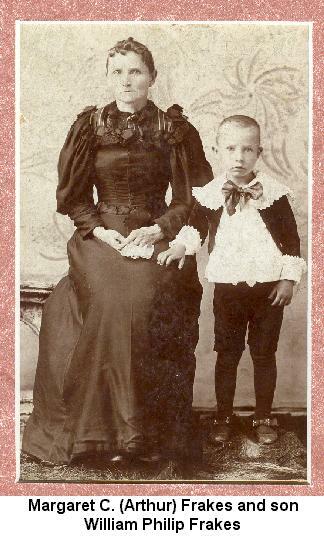 She had another son, Albert MEDAUGH. James H. MEDAUGH would not let Margaret keep her FRAKES son so he had to go back into the orphanage in Terre Haute, Indiana. Again the lack of true caring and love these people had is amazing. Francis' little son was named William Philp FRAKES. Named William after his grandfather, yet his grandfather never saw fit to remove him from the orphanage and raise him, even though he was married to his second wife and raising her children from a previous marriage. I'm afraid I just don't understand how these strong Baptist people could be so cold. They most assuredly had not inherited the love and caring of their ancestors, Sir Thomas and Elizabeth (TAYLOR) FREKE. Something had gone wrong along the way of generations. As soon as William was old enough, the age of 16, Willie, as he was called then, went to work for the Chicago & Eastern Illinois Railroad. During World War I he enlisted in the United Sates Army and in 1921, he was promoted to the rank of 1st Lieutenant. 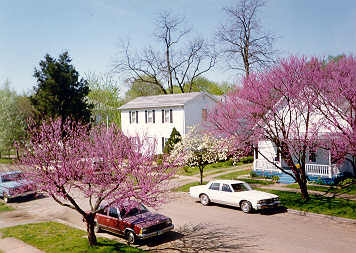 Bill, as he came to be called as an adult, decided to make Salem, Marion County, Illinois his home. He was traveling through on the train and decided that was the place for him. My grandmother, Beatrice Margaret Julietta (MERTEN) FRAKES, said that he was quite the catch. All the girls in town were after him, but she got him. He was handsome and not from Salem. Bill lived with one of Salem's prominent families, Dr. George RAINEY and his wife, May (McMACKIN) RAINEY. She loved Bill as if he were her own son. She called him son and he called her mother. All of his children called her Nana. So the family love that he had been looking for all of his life, since the death of his mother, had finally arrived. He had a new mother and he soon had a wife. Bill FRAKES remained with the Railroad, except during the depression, when he was a Salem Police Officer. He rose to the top position in the railroad before his retirement. He continued to write for the newspaper during those years. He was also involved in Republican politics, as was his wife, Beatrice. He was post commander of the American Legion in Salem, Illinois. Religiously, Bill did not adhere to any organized religion, although he had a strong belief in God, as one can see by his poetry. The Historical LEMEN-FRAKES House, which was built in 1842. President Abraham LINCOLN visited this home on more than one occasion, spending the night at least once. A royal wedding took place in the house between Lydia Gertrude LEMEN and Count John SOBIESKI, Prince Royal, heir to the throne of Poland. This photo was taken in 1994. Bill and Bea had three children, William Randolph FRAKES, Philip Howard FRAKES and Julianne May FRAKES. Obviously both sons received a name of their father. Randolph came from William Randolph HEARST. Howard from Beatrice's brother, Floyd Howard MERTEN. Julianne from her grandparents, Julius and Anna MERTEN. May from May (McMACKIN) RAINEY. William Philip & Beatrice Margaret Julietta (MERTEN) FRAKES Family at the right. Left to Right: Philip, Bea, Bill, Judy and Bill. Both sons were employed with the Illinois Bell Telephone Company until their retirements. 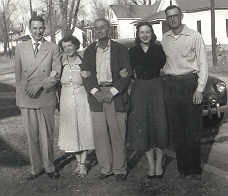 William married Betty Jean HAMMER of Kinmundy and they had two children, Marsha and Mark. Bill and Betty made their home in Collinsville, Madison County, Illinois. Marsha and her husband, Tim BAGLEY, have two children, Jason and Jennifer. Mark FRAKES lived in Austin, Texas where he was a realestate agent. He later moved to Albuquerque, New Mexico. He has a masters in South American History and speaks fluent Spanish. Bill served in the United States Navy during World War II. Julianne "Judy" lives in Bakersfield, California with her husband, Howard Galloway THURMAN, Jr. Howard is a geologist and worked in the oil business, running his own business for years. Their three children, Cynthia (THURMAN) CANNON, Howard Galloway "Trey" THURMAN, III and Van William THURMAN all live in Bakersfield, Kern County, California. Judy's grandchildren: Riley Edward CANNON, William Tyler CANNON, Brooke Nicole THURMAN, Nicole Elise THURMAN and Jordan "Jordie" THURMAN. Philip moved first to Edwardsville then Springfield, Illinois with his family, working for the telephone company. He married Monna Marilyn CONANT in 1952, the daughter of George William and Grace (BASSETT) CONANT of Kinmundy-Alma. She is also a cousin of Bill's wife Betty. Philip served in the United States Army during the Korean War. He received a Bronze Star for heroic action in Korea. While in Korea, he was raised to the rank of 1st Leiut. He was later raised to the rank of Captain in the Illinois National Guard. Phil was promoted to Colonel while serving as Military Advisor to Governors Jim EDGAR and Geroge RYAN of Illinois. In regards to religion, as an adult, Phil became a member of the Southern Baptist Church. He became a deacan at the First Baptist Church of Springfield, Illinois. After moving back to Salem, Illinois, he became a Sunday School teacher at the First Baptist Church of Salem, which he remained up until a few weeks before he died. He was so dedicated that he was giving his Sunday School lessons using oxygen. Phil also became very involved in Republican politics. After moving back to Marion County, Illinois, he became a precinct committeeman, first in Foster Township, then in Salem Precinct 2. He was elected Chairman of the Marion County Republican Central Committee and held the office as many terms as the by-laws allowed. Phil and Monna spent several winters in Apache Jct., Arizona before Phil's health became too bad for them to travel any longer. They enjoyed the warmer and dry climate. Monna's sister, Betty (CONANT)(SEE) BOYD also lived in Arizona, which made it nice for them all. Phil and Monna have three children, Tanya Rae (FRAKES)(COURTRIGHT) BELFIORE, Stephen Philip Howard FRAKES, and Terri June (FRAKES) ADAMS. Their grandchildren are: Nathan Roddy Alan COURTRIGHT, Trent Maurice ADAMS, David Philip Anthony BELFIORE, Brock Richard ADAMS and Daniel William Eli BELFIORE. They now have a great-granddaughter, Madison Jaye COURTRIGHT, born 2002. 1. Francis Freke, Esquire, was known as a person of good repute in Somersetshire, England as well as Thorncombe, Devonshire, England. He had two sons: Robert Freke, Esq. and John Freke. 14. Lt. William Philip Frakes , born 1890, Prairie Creek, Vigo County, Indiana. William married Beatrice Margaret Julietta Merten had three children: William Randolph Frakes, Philip Howard Frakes and Julianne May (Frakes) Thurman. All born in Salem. 15. Col. Philip Howard Frakes , born 1929, Salem, Marion County, Illinois. He married Monna Marilyn Conant, daughter of George William and Grace (Bassett) Conant, 8 October 1952. 16. Stephen Philip Howard Frakes, born 1957, Highland,Madison County, Illinois. I am presently living in Salem, Illinois. 1. 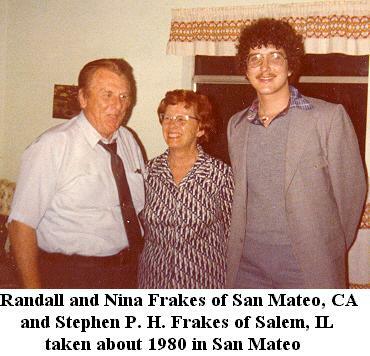 William Randolph Frakes, born 2 Nov 1925, Salem, Illinois. 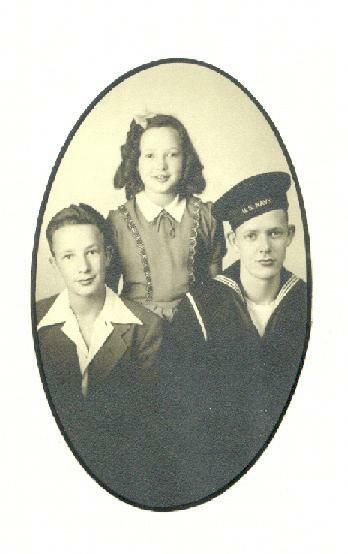 Bill married Betty Jean Hammer, born 26 Jul 1929, Kinmundy, Illinois, daughter of Myron and Cloa Fern (Swift) Hammer. 2. Philip Howard Frakes, born 25 Feb 1929, Salem, Illinois. He died Friday, 16 Sep 2005, Salem, Marion County, Illinois. Phil married Monna Marilyn Conant, born 17 Dec 1933, Foster Township, Marion county, Illinois, daughter of George William Conant and Grace (Bassett) Conant. 3. Julianne May Frakes, born 21 Nov 1934, Salem, Illinois. Judy married Howard Galloway Thurman, Jr., born 21 May 1934, Salem, Illinois, son of Howard Galloway and Ethel E. (Berg) Thurman. 1. Marsha Lynn Frakes, born 27 Mar 1949, Salem, Illinois, daughter of Bill & Betty. Marsha married Timothy Paul Bagley, born 9 Jul 1946, South Norfolk, Virginia..
2. Mark Alan Frakes, born 10 Feb 1954, Cario, Illinois, son of Bill & Betty. 3. Tanya Rae Frakes, born 7 July 1955, Highland, Illinois, daughter of Phil & Monna. Tanya married first Roddy Alan Courtright of Louisville, Illinois. Tanya married second David Joseph Belfiore of Denver, Colorado. 4. Cynthia Tenae Thurman, born 16 September 1955, Salem, Illinois. Cyndy married Riley Cecil Cannon, born 29 Jul 1952, Bakersfield, California. 5. Stephen Philip Howard Frakes, born 2 October 1957, Highland, Illinois, son of Phil & Monna. 6. Howard Galloway "Trey" Thurman, III, born 2 April 1959, Abilene, Texas. Trey married 3rd Tyla (Davis) Reynolds of Bakersfield, California. 7. Van William Thurman, born 17 September 1960, Abilene, Texas. Van married Terri Lynne Martell of Bakersfield, Calfiornia. 8. Terri June Frakes, born 22 April 1962, Highland, Illinois, daughter of Phil & Monna. Terri married Richard Dale Adams of Patoka. 1. Nathan Roddy "Nate" Courtright, born 11 Dec 1973, Centralia, Illinois. Nate married Angie Jaye (Albert) Riley, born 18 Mar 1972. 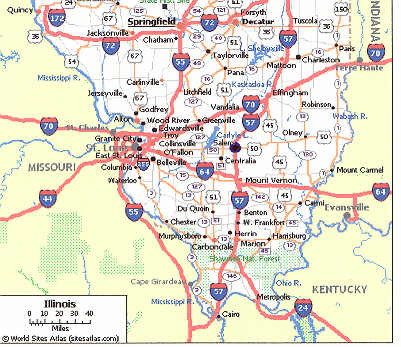 Marion County, Illinois. 2. Jason Paul Bagley, born 1 Apr 1975, Wichita, Kansas. Jason married 2nd Elizabeth Morrow Randman. 3. Jennifer Leigh Bagley, born 23 Oct 1979, Portsmouth, Virginia. Jen married 2nd George Thomas "Mickey" Clutts. He was born 24 Feb 1970. 4. Riley Edward Cannon, III, born 16 Feb 1981, Bakersfield, California. Riley married Marissa Elizabeth Mauer 27 Apr 2007, Bakersfield, California. 5. Trent Maurice Adams, born 5 Dec 1982, Centralia, Illinois. 6. William Tyler Cannon, born 11 Mar 1983, Bakersfield, California. Tyler married Kelly Dawn Albitre 2003, born 19 Apr 1983, Bakersfield, California. 7. Brock Richard Adams, born 26 Sep 1985, Centralia, Illinois. 8. David Philip Anthony Belfiore, born 18 Oct 1985, Orlando, Florida. 9. Brooke Nicole Thurman, born 19 Mar 1986, Bakersfield, California, daughter of Van & Terri. 10. Nicole Elise Thurman, born 9 Jan 1989, Bakersfield, California, daughter of Van & Terri. 11. Daniel William Eli Belfiore, born 3 Feb 1992, Belleville, Illinois. 12. Jourdan Darlene Thurman born 15 Aug 1996, Bakersfield, California, daughter of Trey. *. Jillian Rebecca Riley, born 21 Sep 1992, Beaufort, South Carolina, Stepdaughter of Nathan Courtright. 1. Kylee Dawn Cannon, born 11 Jun 2000, Bakersfield, Kern County, California, daughter of Tyler. 2. Madison Jaye Courtright, born 29 Mar 2002, Breese, Clinton County, Illinois. 3. William Kelby Clutts, born 9 Oct 2006, Belleville, St. Clair County, Illinois. 4. Jacob "Jake" Cannon, born 2006, Bakersfield, Kern County, California, son of Tyler & Kelly. 5. Brooklyn Cannon, born Sep 2007, Bakersfield, Kern County, California. Daugher of Riley & Marissa. 6. Reece Daniel Cannon, born 21 December 2007, Bakersfield, Kern County, California. Son of Tyler & Kelly. 7. Myleigh Rose Clutts, born 11 Apr 2008, Maryville, Madison County, Illinois. 8. Alexandra Ann "Lexi" Bagley, born 24 Jun 2009, St. Louis County, Missouri. Twin of Addie. 9. Addison Lynn "Addie" Bagley, born 24 Jun 2009, St. Louis County, Missouri. Twin of Lexi. 10. Wyatt Rodney William Belfiore, born 17 Dec 2009, Breese, Clinton County, Illinois, son of David and Samantha. 11. Mason Paul Clutts, born Monday, 11 January 2010, Anderson Hospital, Maryville, Madison County, Illinois. 12. Cameron Bennett Cannon, born 24 Jun 2010, Bakersfield, Kern County, California. 13. Jack Campbell, born May 2011, Bakersfield, Kern County, California. 14. Bobbi Julianne Cannon, born 11 Dec 2011, Bakersfield, Kern County, California, daughter of Tyler. 15. Audrian Elyse Martinez, born 30 Mar 2013, Bakersfield, Kern County, California. 16. Ryleigh Rae Belfiore, born 6 Dec 2013, Centralia, Marion County, Illinois. Daughter of Daniel. 17. Gianna Grace Campbell, born May 2014, Bakersfield, Kern County, California. 18. Beau Trenton Bratcher, born 4 Jul 2014, Bakersfield, Kern County, California. 19. Hadleigh Belfiore, born 11 Jul 2014, Breese, Clinton County, Illinois. Daughter of David and Andrea. 20. Grayson Leo Adams, born 17 Aug 2015, Effingham, Effingham County, Illinois. Son of Brock and Lauren. 21. Waylon David Maverick Belfiore, born 26 Nov 2015, Breese, Clinton County, Illinois. Son of David and Andrea. Please Note: I have been working on genealogy since I was a teenager. My grandmothers would talk to me about the families. From those many talks with my grandmothers, Beatrice Margaret Julietta (Merten) Frakes and Grace (Bassett) Conant, a passion was born. I even chose to go to college in New England so that I could do research while there. Traveled to England and Germany for research. I love doing it and I have loved sharing it. Unfortunately, there are some really rude and snobby family genealogists out there. They ask/demand your research material that you have worked so hard compiling. They want the information without doing the work. When you share it, they don't so much as say "thank you." It is not my job to convince anyone that my research is accurate. I have collected so much information that I have several file cabinets full. I have read endless books, researched endless libraries, exchanged information with some very wonderful people, here in the United States, England, Australia, New Zealand and South Africa. I have spent hours and hours in county court houses, city halls, churches, historical commissions, cemeteries, etc. I have compiled all of this information for my family and for myself, and for anyone who is appreciative of my work. I have no children of my own, but I do have several nephews and nieces. They benefit, as will their children, from my research. I have been president of our city historical commission and have been an officer of the county Genealogical Society. I know the importance of accurate information and not believing everything that is handed to me from others. I have been very careful to make sure that what I have put on this web page is as accurate as possible. So, I welcome emails from other Frakes/Freke families who have comments or just want to say "hi." I love meeting other Frakes' and Freke's. I also welcome additions, corrections and even questions. But to those people who are snobby and rude, don't bother emailing. Life is too short for me to allow your negativity into my life. I would like to thank a few people who I have been in contact with over the years, most of whom have crossed over already. My thanks to them could never be enough. Go to Castle Donington Frakes Family to see this Frakes line of descent. Hazel is at #10-3-8-7. Dennis FRAKES (1917-1998) of Nottingham, England. Sheila (ROBOTHAM)HOLMES of Bramcote, Nottingham, England. Go to Castle Donington Frakes Family to see this Frakes line of descent. Sheila is #10-3-6-1-?. Dulcie (FRAKES) ALLEN of Castle Donnington, England. Go to Castle Donington Frakes Family to see this Frakes line of descent. Dulcie is #10-5-1-1. John and Rosalind Ann "Ros" (SEWELL) FREKE of New Zealand, formerly of Bristol, England. This Web Page was created 2 October 1999 at 8:23 P.M. Copyright © 1999-2019 stephenfrakes All rights reserved.